I have updated the map with more cities in Kashmir and the major rivers of Punjab. 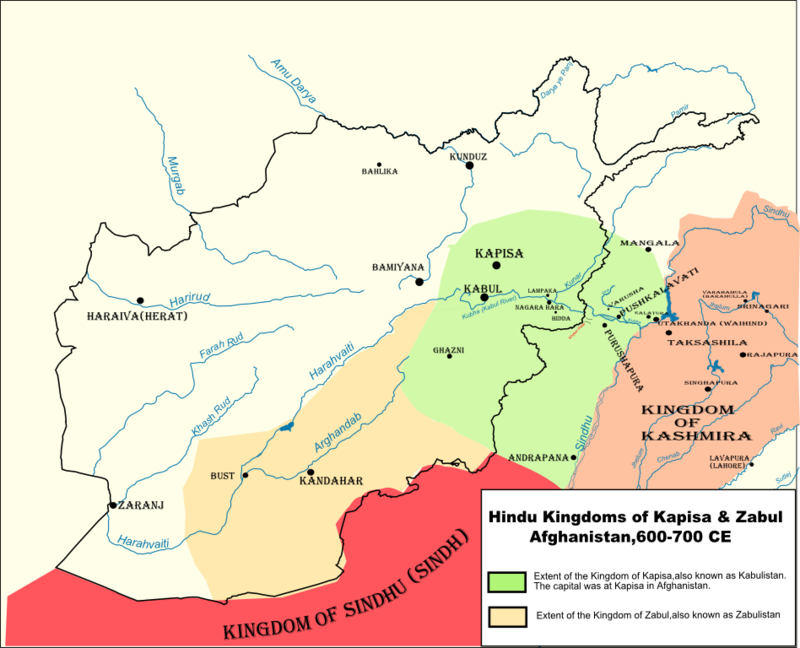 The above map shows the extent of the Hindu kingdoms of Kabul and Zabul in the period of 600-700 CE.I was spurred to create the map as I wanted to a graphical representation of what area came under these two ruling houses.it is a different matter reading on paper that Kabul ruled this area and that,and a completely different aspect seeing it highlighted on a map. I will keep updating the map with more cities in Sindh,Punjab and Kashmir.Plus will do more maps for the later periods of the Shahi rule where there kingdom shrunk considerably,till this glorious dynasty was extinguished while fighting against Mohammed Ghazni in 1026 CE. I first came to know of the Hindu Shahi kings of Kapisa (later on their capital moved to Kabul) an article in India Today more than a decade back. My curiosity was aroused as I never knew that there ever existed a Hindu ruling house in Afghanistan,let alone two powerful Hindu kingdoms.Later on I found more references to the ferocious resistance these two Hindu dynasties offered to the Islamic invaders.Sri Sita Ram Goels books on Voice of India website were an excellent source of information. The first Islamic invasion of the Arabs which lasted for almost three hundred years broke apart on these two formidable break waters.It was the Turk invasion starting somewhere around 900 AD which proved to be the undoing of these two great Kingdoms. Thus were the great defenders of the gates of India, the kings of Kabul and Zabul, whose name has been all but forgotten by an ungrateful people. These were men of peerless courage and a soul of steel forged in the fire of war. They were the sword arm of Dharma, defending the land of the Bharatas against those who would seek to defile it by their touch. It is not surprising that most of us have never heard of them,our “secularised” education system makes sure we never come to know that there was any kind of resistance offered by our ancestors.It is a part of the social engineering programme to brain wash entire generations with the completely bogus message of “tolerance” and “turning the other cheek”!! These glorious names have not been forgotten by history, but only pushed into the shadows by those who would seek to rewrite history of Sanatana Dharma to suit their own ends. The primary reference i have used is ALexander Cunningham’s “Geography of Ancient India”.It is availaible for free download from Internet archive. A secondary reference has been the excellent ” Digital South Asia Library” series of maps.